Wellness programme paves the way to a happier, healthier construction industry. Tshegare Moletsane, SANRAL Project Manager in Limpopo, (Middle) and workers celebrating World Aids Day 2017. The South African National Roads Agency (SOC) Limited (SANRAL) is as committed to the quality of life of its workers as it is to the quality of the country’s national roads. The agency has a wellness programme that paves the way to a happier, healthier construction industry. 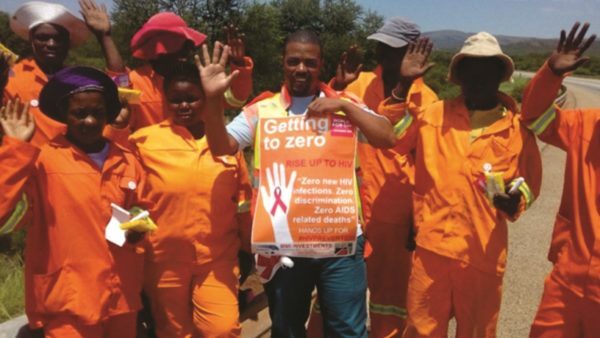 While SANRAL is focused on its mandate of improving and maintaining the national road network, it has placed a focus on restoring and maintaining the dignity of labourers working on its projects and their families by implementing an integrated wellness programme on all Limpopo routine road maintenance (RRM) projects. The wellness programme, which is centred around health risk assessment, facilitation of health topics and monitoring, has been running concurrently with the 12 RRM projects from January 2016. Testing for HIV, TB, cholesterol, glucose and body mass index has provided valuable insights and has led to the establishment of an emergency 24/7 call centre that workers, especially those with adverse issues, can utilise for health management and counselling. The call centre grants employees and their family members access to biological monitoring and psychological counselling, which assists with stress management, substance abuse and critical incident management. The roads SANRAL builds and maintains connect people to opportunities and serve as a vehicle for the province’s economy. Thus, project interruptions due to absenteeism and low levels of productivity are an unwanted inconvenience. In view of this, SANRAL’s management team acknowledged it was important to invest in bringing health facilities to their people. Besides the obvious health benefits to workers and the community, the implementation of the programme has also had an impact on unemployment in project areas. On each project SANRAL commences, they appoint a Wellness Champion who is tasked with educating and informing labourers on healthy living. According to Tshegare Moletsane, SANRAL Project Manager in Limpopo, educating labourers has brought about considerable changes. It has dealt with the stigma around HIV/AIDS and more men on site have embraced the importance of being tested and knowing their state of health. Following the many successes of the rollout, SANRAL has implemented the programme nationally, and with the agency’s footprint across South Africa one can only imagine the positive impact it has had on communities across the country, said Mona.